Hi, I'm Taylor! I am currently attending Florida State college at Jacksonville for my Associates degree in music. I then plan to transfer to a major university to continue towards a music education degree. 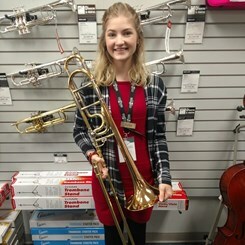 My main instrument is bass trombone, but I play baritone and tenor trombone as well. I am curently in our Jazz band as principal bass trombone and symphonic band as well. I started working at Music and Arts in August and I am loving it so far! If you have any questions or need anything, let me know!